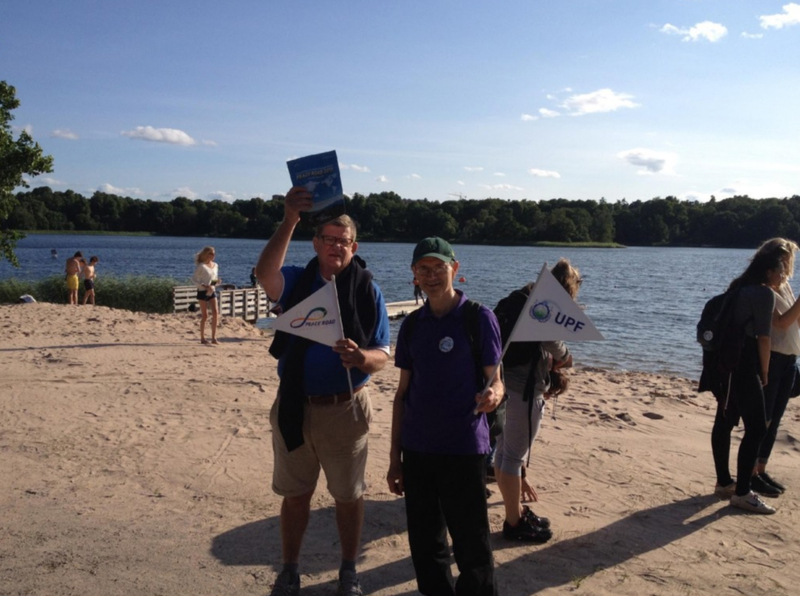 FFWPU Sweden: On July 7, about 20 members gathered at the Holy Ground, located right close to the city center in Stockholm, Sweden. Our walk took us past our church’s first public witnessing center, where many lectures and public activities were held in the 1970s. Several members had joined through this place, so it had special meaning to many older members even though 2nd-generation member didn’t know about it. The walk with the Peace Road flag continued north into a large park area which is now named the Royal National City Park. Located right north of the city is this large lake and park area. We walked along the water and passed through several buildings that are significant to Sweden. First we passed the museum of one Sweden’s most famous sculptures, Carl Eldh, located on a beautiful hill overlooking the lake. Further on, we passed the residence of the Swedish crown princess, Stockholm University and the Royal Swedish Academy, which appoints the Nobel Prize winners in Physics and Chemistry. After an hour and 45 minutes, we arrived at the Swedish provisional Peace Embassy. There, we could rest our legs, enjoy fellowship with share and a nice barbecue. These days we have had poor weather, but we could feel Heavenly Parent’s grace when the sun lit up during our walk, with so we could enjoy the beautiful scenery. Sweden is also planning a second Peace Road event in Uppsala, on August 2.